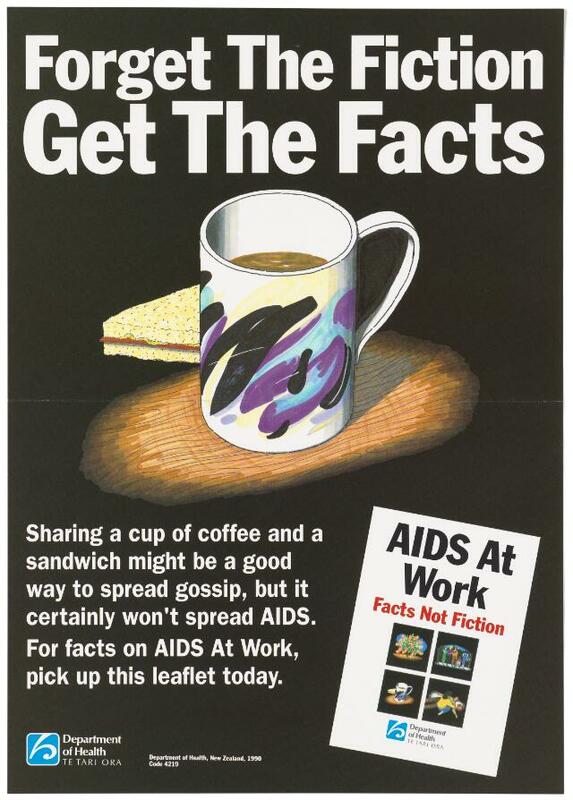 A mug of coffee and a sandwich representing an advertisement for a leaflet on facts on AIDS at Work by the Department of Health, New Zealand. Colour lithograph, 1990. Forget the fiction. Get the facts. Sharing a cup of coffee and a sandwich might be a good way to spread gossip, but it certainly won't spread AIDS. For facts on AIDS At Work, pick up this leaflet today. AIDS At Work. Facts Not Fiction. Department of Health Te Tari Ora. Department of Health, New Zealand, 1990, Code 4219.